Oh! This cover is all kinds of gorgeous. And it sounds so good too. Sigh. 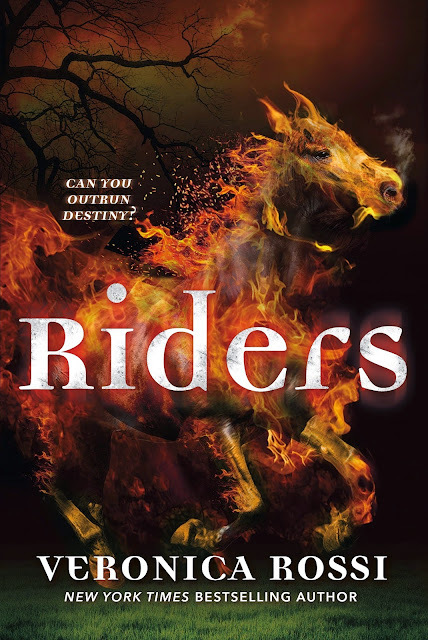 I cannot wait to read Riders :D It shall be perfect. <3 Because I adore Veronica Rossi. So much. She's amazing. So kind and sweet. I loved her Under the Never Sky trilogy oh so much. And I simply can't wait to read more by her :D And just, gosh damn. This book sounds epic. The summary is so amazing. I cannot wait to get to meet Gideon :D And everyone. And ugh, this plot sounds amazing. I want this book so badly. February 2nd cannot arrive fast enough. I will love this book. And I can't wait to get to read it :D What do you think? Riders. Veronica Rossi. Official Reveal Post. The Book Depository. Amazon. This is stunning! I wasn't much interested in Rossi's dystopian series,..but a guy who becomes part of the four horsemen?? THAT strikes my interest! Thanks for sharing this, Carina! Definitely gorgeous! I love horses, though the face of this one with the flames is a tad bit creepy... But still awesome! This sounds fantastic, doesn't it?? And that cover is awesome and creepy and simply brilliant! Thank you for sharing Carina! LOVE! I relaly enjoyed Rossi's Under the Never Sky trilogy, and her NA series, but I'm excited for more YA! I love Under the Never Sky SO FREAKING MUCH. I need this book in my life! Thank you for sharing, Carina! I had missed this news on Twitter! Ack!!! I'm so happy she's coming out with a new book!! !